There has been an explosion in various diet / nutrition apps that are available to download on iPhone or android. These apps have had such an impact that Weight Watchers company reported a 19% drop in profit citing “losing customers to free apps and other electronic slimming aids” as the main reason for the decline. 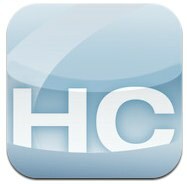 Here I review one of these apps. Feeding your kids app is an iPhone app aimed at parents who are interested in teaching their children to eat healthy and varied diet and to set early heathy eating habits. It has been created in partnership with the Clinton Global Initiative and is free to all parents. It is a 42 day programme and each day presents a new challenge. These challenges range from reviewing what you are doing today, changing what you eat at mealtimes, scheduling time for family meals and changing your shopping habits. Each challenge comes with ideas and tips on how to make them happen. In addition, there are two functions called ‘thoughts’ and ‘help me’ which provide extra support for each challenge. The application comes with social networking connectivity called ‘support me’ where users can share their progress and thoughts with others via e-mail, facebook or twitter. I have now been using this app for 29 days and so far it has been a good experience. The app has a simple and clear layout with the ‘summary’, ‘challenge’ and ‘thoughts’ tabs. It is really easy to use and the wording is kept to a minimum. Sometimes the challenges provide links to other websites and books for extra inspiration. 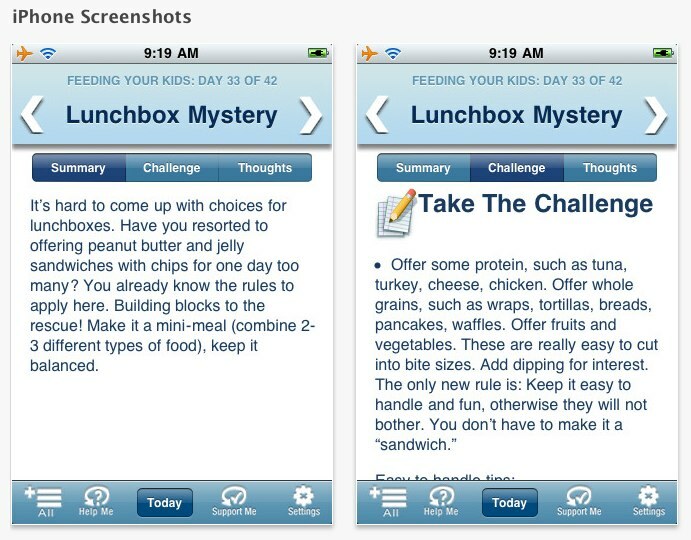 By using this app I learned a few tips and tricks for the future for example to give kids smaller meals and give them seconds so they feel more in control. The advice can be applied for children of any age. I found it little bit frustrating that the programme is set to have a challenge for each day. Sometimes I was already doing what the challenge was asking me to do yet I was not able to skip to the next one as I needed to wait until the next day. Equally some of the challenges took longer than one day to complete. Habits do not change over night and I feel the application would have been much stronger had there been a keep in touch function which would provide monthly or quarterly check ins and tips on an ongoing basis after you finish the initial 42 day challenge. Tags: Eating, Family, Food, habit, Health, healthy, Home, kids, Meal, nutrition, Parent | Permalink.